Begin by sketching on the drawing of your backyard where you want to put plantings and other features for wildlife based upon the availability of space. This can be drawn directly on the original map or on an overlay. The overlay method is particularly useful if you plan to work in increments over a period of a few years. Separate overlays can be made for each year of development or one overlay can be color-coded to represent successive years of development. 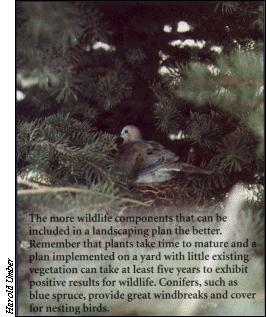 A yard will be in one of three "stages" as you begin adding plans for wildlife components. It takes somewhere between five and ten years to progress from the plantings of the first stage to the fairly mature condition of Stage II. In this stage, there will be enough flowers, grasses, and fruit to attract a variety of birds, small mammals, insects and amphibians. A small pond can replace the bird bath and a variety of shrubs and grasses will allow some songbirds to nest. Young fruit-bearing trees will provide some food for wildlife. Use the following list to get you thinking about the possibilities for your own yard. Starting from scratch, it will take 30-40 years to reach this stage. If your yard already has a reasonable number of large trees that produce fruits and nuts, shrubs and medium-sized plants can be added to enhance the understory and achieve this stage in 5- 10 years. Stage III attracts the maximum number of wildlife species because it exhibits the largest amount of "edge." Edge, as you remember, is defined as a habitat with the greatest variety of vegetation types, heights, and arrangements, along with the addition of other wildlife components to make homes for wildlife. In this stage, birds such as the oriole will nest in the highest branches of the mature trees; warblers will feed in the tree tops; chipping sparrows will nest in the dense branches of the conifers. Rabbits will live in a brush pile, feed on low shrubs and raise their young in dense underbrush. Squirrels, kestrels, and bats will take advantage of hollow cavities in the dead and dying trees or nest boxes. Insects will attract insect eating birds like the nighthawk. Frogs living in, and near, a wetland will provide food for wading birds such as the heron or land mammals like the raccoon. Once you have decided what stage your yard is in, you are now ready to begin planning the addition of components which will attract wildlife to your back yard.